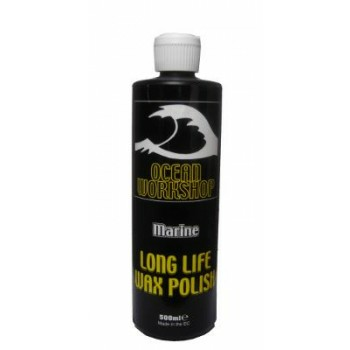 A high performance wax polish specially formulated to be easy to apply and provide long term protection. Its water-based wax system is tolerant of wet surfaces when applied, and buffs to a high gloss. Wash boat thoroughly using Ocean Workshop Deck and Hull Cleaner. Allow to dry as much as possible. Shake bottle before use and apply using a soft cloth in overlapping strokes, working into the surface. Treat one section at a time and allow to dry to a haze before buffing with a clean cloth. A higher gloss can be achieved by buffing again after one hour, when the polish will have hardened. Ensure surfaces are not be too hot when applying polish.